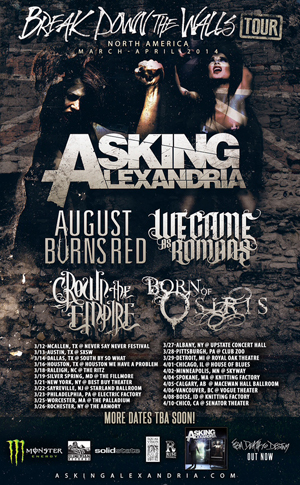 ASKING ALEXANDRIA makes their much-anticipated return to North America in March & April 2014 headlining the massive "Break Down The Walls" tour. This stellar package also features AUGUST BURNS RED, WE CAME AS ROMANS, CROWN THE EMPIRE And BORN OF OSIRIS, which makes this easily one of 2014's most explosive, must-see events. Tour dates are below and more shows are TBA. Stay tuned to askingalexandria.com and sumerianrecords.com for additional information and updates.